Examples of how use XlsxWriter to generate Excel outlines and grouping. These examples focus mainly on collapsed outlines. See also Working with Outlines and Grouping. # outlines.py example program for more general examples. # This function will generate the same data and sub-totals on each worksheet. # Used in the first 4 examples. # Adjust the column width for clarity. # Add the data, labels and formulas. # generated when you use the Excel Data->SubTotals menu item. # Write the sub-total data that is common to the row examples. # Example 2: Create a worksheet with collapsed outlined rows. # This is the same as the example 1  except that the all rows are collapsed. # with the optional parameter, 'collapsed'. # Example 3: Create a worksheet with collapsed outlined rows. # Same as the example 1  except that the two sub-totals are collapsed. # Example 4: Create a worksheet with outlined rows. # Example 5: Create a worksheet with outlined columns. # Add bold format to the first row. # Set column formatting and the outline level. # Write the data and a formula. 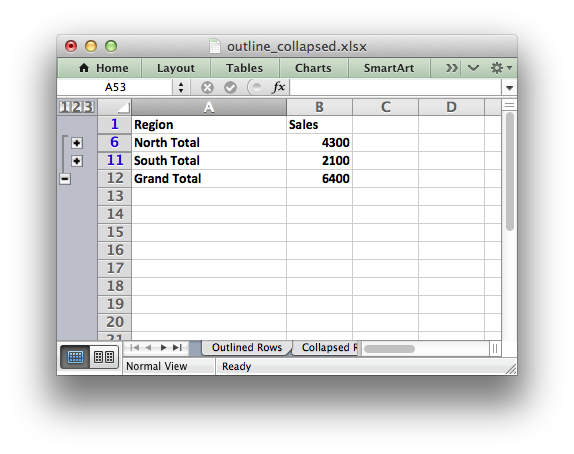 # Example 6: Create a worksheet with collapsed outlined columns. # This is the same as the previous example except with collapsed columns. # Reuse the data from the previous example.